Atlantans know they can rely on Cacao for high-quality, fair trade chocolate, but there’s a new name in town promising truffles that are also gluten- and soy-free. Nichobella Organics—named after founder Nichole Dandrea and her poodle, Isabella—has partnered with Cacao for production and sells its vegan chocolate snacks in Whole Foods Market. “When I created Nicobella, I wanted it to be a platform to inspire people toward healthy, holistic lifestyles through plant-based eating, compassionate living, and eco-friendly practices,” says Dandrea, a registered dietician, nutritionist and yoga instructor. At first, she didn’t know how to make chocolate so she tried simply melting it and adding high antioxidant foods. “They were pretty tasty but didn’t look too pretty,” she says. 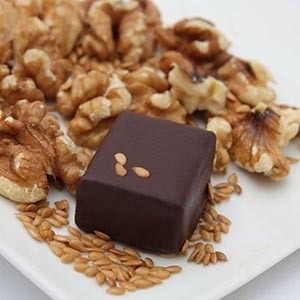 To get the basics down, she enrolled in an online chocolate school, Ecole Chocolat, and afterwards went to work on flavors like blueberry almond, ginger green tea, pumpkin chai, sunflower butter banana, and walnut flaxseed crunch. The walnut truffle features more walnuts than chocolate, and the pumpkin truffle is made with whole pumpkin seeds ground into pumpkin butter. She also sells peanut butter squares made with molasses, 60% organic and Fair Trade dark chocolate, and Himalayan sea salt. In addition, Nicobella makes a snack called Munch that contains 7 grams of protein and 7 grams of fiber. It comes in three varieties: omega (walnuts and toasted flax), coco-nut, and maple-nut, and sells for $5.95 for a 2-ounce bag online. Nicobella just released a new spring truffle flavor, lavender mint, and is working on a rustic, raw superfood hand-rolled truffle. Nicobella products are also available at Savi Urban Market, Atlanta Made, the Mercantile, Juicy Jenny, Eco Denizen, Roots Pressed Juices, Evolation Yoga, and Christophe’s To Go, as well as events such as the Atlanta Veg Fest, Root City Market, and the upcoming Wig Wam Festival on May 3. Use code AtlantaMag15 for 15% off your first online order.